The Italian builder Fincantieri has completed maintenance on Eclipse, which at 162.5m is the largest private yacht in the world. 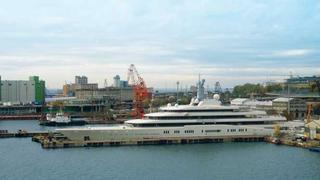 Eclipse, launched by Blohm & Voss in 2010, was put into drydock at the Trieste San Marco shipyard for the recent project. Following successful completion of the works, she underwent sea trials and has now left the yard.